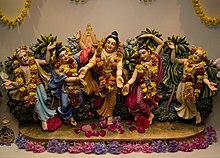 Gaudiya Vaishnavism (also known as Gauḍīya Vaiṣṇava tradition, Bengali Vaishnavism, or Chaitanya Vaishnavism) is a Vaishnava religious movement inspired by Chaitanya Mahaprabhu (1486–1534) in India. "Gauḍīya" refers to the Gauḍa region (present day Bengal/Bangladesh) with Vaishnavism meaning "the worship of Vishnu or Krishna". Its theological basis is primarily that of the Bhagavad Gītā and Bhāgavata Purāṇa as interpreted by early disciples of Chaitanya such as Sanātana Gosvāmin, Rūpa Gosvāmin, Jīva Gosvāmin, Gopala Bhaṭṭa Gosvāmin, and others. The focus of Gaudiya Vaishnavism is the devotional worship (bhakti) of Radha and Krishna, and their many divine incarnations as the supreme forms of God, Svayam Bhagavan. Most popularly, this worship takes the form of singing Radha and Krishna's holy names, such as "Hare", "Krishna" and "Rama", most commonly in the form of the Hare Krishna (mantra), also known as kirtan. The movement is sometimes referred to as the Brahma-Madhva-Gaudiya sampradaya, referring to its traditional origins in the succession of spiritual masters (gurus) believed to originate from Brahma. 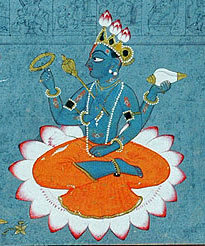 It classifies itself as a monotheistic tradition, seeing the many forms of Vishnu or Krishna as expansions or incarnations of the one Supreme God, adipurusha. According to Gaudiya Vaishnava philosophy, consciousness is not a product of matter, but is instead a symptom of the soul. All living beings (jivas), are distinct from their current body - the nature of the soul being eternal, immutable, and indestructible without any particular beginning or end. Souls which are captivated by the illusory nature of the world (Maya) are repeatedly reborn among the various (8,400,000 in number) species of life on this planet and on other worlds in accordance to the laws of karma and individual desire. This is consistent with the concept of samsara found throughout Hindu belief. Release from the process of samsara (known as moksha) is believed to be achievable through a variety of spiritual practices. However, within Gaudiya Vaishnavism it is bhakti in its purest state (or "pure love of God") which is given as the ultimate aim, rather than liberation from the cycle of rebirth. One of the defining aspects of Gaudiya Vaishnavism is that Krishna is worshiped specifically as the source of all Avataric incarnations of God. This is based on quotations from the Bhagavata Purana, such as "krsnāstu bhagavan svayam", literally "Krishna is God Himself". A particularly distinct part of the Gaudiya Vaishnava philosophy espoused by Chaitanya Mahaprabhu is the concept of Achintya Bheda Abheda, which translates to "inconceivable oneness and difference" in the context of the soul's relationship with Krishna, and also Krishna's relationship with his other energies (i.e. the material world). In quality, the soul (jiva) is described as being identical to God, but in terms of quantity individual jivas are said to be infinitesimal in comparison to the unlimited Supreme Being. The exact nature of this relationship (being simultaneously one and different with Krishna) is inconceivable to the human mind but can be experienced through the process of Bhakti yoga. This philosophy serves as a meeting of two opposing schools of Hindu philosophy, pure monism (God and the soul as one entity) and pure dualism (God and the soul as absolutely separate). This philosophy largely recapitulates the concepts of qualified nondualism practiced by the older Vedantic school Vishishtadvaita, but emphasizes the figure of Krishna over Narayana and holy sites in and around Bengal over sites in Tamil Nadu. In practice, Gaudiya Vaishnava philosophy has much more in common with the dualistic schools especially closely following theological traditions established by Madhvacharya's Dvaita Vedanta. The practical process of devotional life is described as bhakti or bhakti-yoga. The two main elements of the bhakti-yoga process are vaidhi bhakti, which is devotional service through practice of rules and regulations (sadhana) and raganuga bhakti, which is taken as a higher stage of more spontaneous devotional service based on a selfless desire to please one's chosen Ishta-deva of Krishna or his associated expansions and avatars. Practicing vaidhi-bhakti with a view to cultivate prema creates eligibility for raganuga-sadhana. Both vaidhi and raganuga bhakti are based on the chanting or singing of Krishna's names. Attainment of the raganuga stage means that rules of lifestyle are no longer important and that emotions or any material activities for Krishna should not be repressed. Vaidhi-bhakti's purpose is to elevate the devotee to raganuga; something which generally takes a long time. Within his Siksastaka prayers, Chaitanya compares the process of bhakti-yoga to that of cleansing a dirty place of dust, wherein our consciousness is the object in need of purification. This purification takes place largely through the chanting and singing of Radha and Krishna's names. Specifically, the Hare Krishna (mantra) is chanted and sung by practitioners on a daily basis, sometimes for many hours each day. Famously within the tradition, one of Chaitanya Mahaprabhu's close associates, Haridasa Thakur, is reported to have chanted 300,000 holy names of God each day. Many Gaudiya Vaishnavas will live for at least some time in their life as monks (brahmacharya). Chaitanya Mahaprabhu (also transliterated Caitanya, IAST Caitanya Mahāprabhu; 18 February 1486 – 14 June 1534) was a Bengali spiritual teacher who founded Gaudiya Vaishnavism. He is believed by his devotees to be Krishna himself who appeared in the form of His own devotee in order to teach the people of this world the process of Bhakti and how to attain the perfection of life. He is considered as the most merciful manifestation of Krishna. 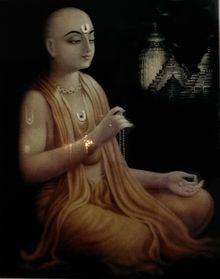 Chaitanya was the proponent for the Vaishnava school of Bhakti yoga (meaning loving devotion to God), based on Bhagavata Purana and Bhagavad Gita. Of various incarnations of Vishnu, he is revered as Krishna, popularised the chanting of the Hare Krishna mantra and composed the Siksastakam (eight devotional prayers) in Sanskrit. His followers, Gaudiya Vaishnavas, revere him as a Krishna with the mood and complexion of his source of inspiration Radha. Over the three centuries following the disappearance of Sri Chaitanya Mahaprabhu, the Gaudiya Vaishnava tradition evolved into the form in which we largely find it today in contemporary India. In the early years of the tradition, the followers of Nityananda Prabhu, Advaita Acharya and other companions of Chaitanya Mahaprabhu educated and initiated people, each in their own locales across Bengal. Chaitanya Mahaprabhu requested a select few among his followers, who later came to be known as the Six Gosvamis of Vrindavan, to systematically present his theology of bhakti in their writings. This theology emphasized the devotee's relationship to the Divine Couple, Radha and Krishna, and looked to Caitanya as the embodiment of both Radha and Krishna. The six were Rupa Goswami, Sanatana Goswami, Gopala Bhatta Goswami, Raghunatha Bhatta Goswami, Raghunatha dasa Goswami and Jiva Goswami. In the second generation of the tradition, Narottama, Srinivasa and Shyamananda, three students of Jiva Goswami, the youngest among the six Goswamis, were instrumental in spreading the theology across Bengal and Orissa. The festival of Kheturi (approx 1574), presided over by Jahnava Thakurani, the wife of Nityananda Rama, was the first time the leaders of the various branches of Chaitanya Mahaprabhu's followers assembled together. Through such festivals, members of the loosely organized tradition became acquainted with other branches along with their respective theological and practical nuances. That notwithstanding, the tradition has maintained its plural nature, having no central authority to preside over its matters. The festival of Kheturi allowed for the systemization of Gaudiya Vaishnava theology as a distinct branch of Vaishnava theology. Gaudiya Matha historians assert that in the 17th–18th century, there was a period of general decline in the movement's strength and popularity characterized by decreased preaching and appearance of persons following and promoting degraded teachings and practices. These groups are called apasampradayas. In the 17th century, Vishvanath Chakravarti Thakur held great merit in clarifying core doctrinal issues over the practice of raganuga-bhakti through works such as Raga-vartma-chandrika. His student Baladeva Vidyabhushan wrote a famous commentary on the Vedanta-sutra called Govinda Bhashya. The 18th century saw a number of luminaries headed by Siddha Jayakrishna Das Babaji of Kamyavan and Siddha Krishnadas Babaji of Govardhan. The latter, a widely renowned teacher of the mode of internal worship (raga-bhajan) practiced in the tradition, is largely responsible for the current form of devotional practice embraced by some of the traditions based in Vrindavan. From the very beginning of Chaitanya's bhakti movement in Bengal, Haridasa Thakur and others Muslim by birth were the participants. This openness received a boost from Bhaktivinoda Thakur's broad-minded vision in the late 19th century and was institutionalized by Bhaktisiddhanta Sarasvati Thakur in his Gaudiya Matha in the 20th century. Sri Gaudiya Math (Kolkata, estd. 1930) is formed headquarter of Gaudiya Math, now headquarter of Gaudiya Mission. This period was followed by a renaissance which began at the start of the 20th century. This change is believed to have happened largely due to the efforts of a particularly adept preacher known as Bhaktivinoda Thakur, who also held the position of a deputy magistrate with the British government. Bhaktivinoda Thakur's son grew up to be both an eminent scholar and highly influential Vaishnava preacher, known in his later life as Srila Bhaktisiddhanta Sarasvati Thakur. In total, Bhaktisidhanta Sarasvati Thakur founded in 1918 Gaudiya Math and later sixty-four Gaudiya Matha monasteries in India, Burma and Europe. The first European preaching center was established in London in 1933 (London Glouster House, Cornwall Garden, W7 South Kensington) under the name 'Gaudiya Mission Society of London'. Soon after the Bhaktisiddhanta Saraswati's death (1 January 1937), a dispute began and the original Gaudiya Math mission divided into two administrative bodies which continued preaching on their own, up to the present day. In a settlement they divided the 64 Gaudiya Math centers into two groups. Sri Chaitanya Math Branch were headed by Srila Bhakti Vilasa Tirtha Maharaj. Gaudiya Mission were headed by Ananta Vasudev Prabhu, who became known as Srila Bhakti Prasad Puri Maharaj after accepting sannyasa for short duration. Many of the disciples of Bhaktisiddhanta Sarasvati did not agree with the spirit of these newly created two fractions, or were simply inspired to expand the mission of their guru on their own enthusiasm, started their own missions. His disciple Srila Prabhupada went to the west in order to spread Gaudiya-Vaishnavism. The society he established, the 'International Society for Krishna Consciousness' (ISKCON) still functions today and continues its preaching mission. In Gaudiya Vaishnavism, Krishna is seen as the original form of God, i.e. the source of Vishnu and not as His avatar. This is based primarily on verse 1.3.28 of the Bhagavata Purana (krsnas tu bhagavan svayam) and other scriptures. This belief is shared by the Nimbarka and Vallabha sampradayas, but not by the Ramanuja and Madhva schools, who view Krishna as an avatar of Vishnu. As Krishna's consort, Radha is similarly viewed as the source of all other Shaktis, including Lakshmi and Sita. "O most munificent incarnation! You are Krishna Himself appearing as Sri Krishna Caitanya Mahaprabhu. You have assumed the golden colour of Srimati Radharani, and You are widely distributing pure love of Krishna. We offer our respectful obeisances unto You." Although this viewpoint outside of the Gaudiya tradition was disputed, Chaitanya's followers prove it by pointing at verses throughout the Puranic literatures as evidence to support this claim. Many of them (not all) are autonomous branches of the tree of the Gaudiya Math and members of the World Vaisnava Association – Visva Vaisnava Raj Sabha (WVA—VVRS) which had been established in 1994. ^ De, Sushil K. (1942). Early History of the Vaishnava Faith and Movement in Bengal. p. 703. ^ Bryant, Edwin (2017). Bhakti yoga : tales and teachings from the Bhāgavata Purāṇa. p. 650. ISBN 9780865477759. ^ Holdrege, Barbaraga (2017). Bhakti and Embodient: fashioning divine bodies and devotional bodies in Kṛṣṇa Bhakti. ISBN 1138492450. ^ "Bhagavad Gita 2.20". Bhagavadgitaasitis.com. Archived from the original on 28 September 2011. Retrieved 17 June 2013. ^ Caitanya-Caritamrita Ml 20.108-109 Archived 11 May 2008 at the Wayback Machine "It is the living entity's constitutional position to be an eternal servant of Krishna because he is the marginal energy of Krishna and a manifestation simultaneously one with and different from the Lord, like a molecular particle of sunshine or fire." ^ "B-Gita 7.8". Vedabase.net. Archived from the original on 19 July 2013. Retrieved 17 June 2013. ^ Tripurari, Swami, Learn to Think Differently, Sanga, 1999. ^ "Teachings of Lord Caitanya - Sikshashtakam". Lordcaitanya.com. Archived from the original on 3 February 2014. Retrieved 17 June 2013. ^ Buxton, Julia (17 December 2010). The Politics of Narcotic Drugs: A Survey. p. 189. ISBN 1857437594. ^ Women Saints in Gaudiya Vaishnavism "The event at which this took place was the famous Kheturi festival already mentioned above, the date of which is still a matter of conjecture, but likely took place in the 1570s." ^ Bryant, Ekstrand 2004, p. 130. ^ Jalakara dasa. "The Sons of the Son: The Breakup of the Gaudiya Matha". Retrieved 5 December 2018. ^ "Bhagavata Purana 1.3.28". Srimadbhagavatam.com. Archived from the original on 23 January 2013. Retrieved 17 June 2013. ^ "Teachings of Lord Chaitanya". Vedabase.net. Retrieved 17 June 2013. ^ "Caitanya Caritamrita 2.19.53". Caitanyacaritamrta.com. Archived from the original on 14 February 2012. Retrieved 17 June 2013. ^ Bhagavata Purana 11.5.32 Archived 8 February 2007 at the Wayback Machine "In the age of Kali, intelligent persons perform congregational chanting to worship the incarnation of Godhead who constantly sings the names of Krishna. Although His complexion is not blackish, He is Krishna Himself. He is accompanied by His associates, servants, weapons and confidential companions." ^ "Sri Chaitanya Mahaprabhu predicted". Veda.harekrsna.cz. Retrieved 17 June 2013. ^ Swami B. A. Paramadvaiti (1999). Our Family — the Gaudiya Math. A study of the expansion of Gaudiya Vaisnavism and the many branches developing around the Gaudiya Math. VRINDA The Vrindavan Institute for Vaisnava Culture and Studies. ISBN 3-927745-90-1. Broo, Måns (2003). As good as God: the guru in Gauḍīya Vaiṣṇavism. Åbo Akademi University Press. ISBN 951-765-132-5. Bryant, Edwin; Ekstrand, Maria, eds. (2004). The Hare Krishna Movement: The Postcharismatic Fate of a Religious Transplant. NY: Columbia University Press. ISBN 0-231-12256-X. De, Sushil K. (1942). Early History of the Vaisnava Faith and Movement in Bengal from Sanskrit and Bengali Sources. Calcutta: General Printers and Publishers. Kapoor, O.B.L. (1977). The Philosophy and Religion of Śrī Caitanya: The Philosophical Background of the Hare Krishna Movement. New Delhi: Munshiram Manoharlal. Rosen, Steven J. (1992). Vaishnavism: Contemporary Scholars Discuss the Gaudiya Tradition. NY: Folk Books. ISBN 0-9619763-6-5.